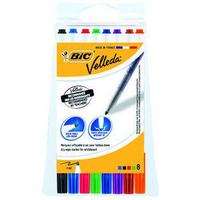 Fine tip whiteboard marker ideal for school and household use. 1.5mm line width. Alcohol based, low odour ink. Wipes off easily even after a few days. Strong blocked nib. Colour: Assorted. Approx Dimensions (CM): D15.3 W10.3 H1.2. Approx Weight (KG):0.0551.